The answers may surprise you. The health benefits may surprise you. Let’s look at why a buying a system for your entire home is better. The first reason as to why is obviously water quality. With a whole home unit you get the equivalent of high quality bottled water from any faucet in your home. The second reason as to why is less waste going to landfills. That’s right, there are no plastic bottles, or jugs, to fill up the landfill. Even though this water is the equivalent of high quality bottled water, there is one thing that a whole house filter doesn’t have. Plastic water bottles. The main filter is certified to provide 600,000 (EQ-600) to 1,000,000 (EQ-1000) gallons of crystal clear water. That’s 2.4 to 7.5 million 16 ounce bottles of water, and no plastic bottles in the landfill! The third reason as to why is thrift. Thrift as in thrifty. You will save a lot of money over buying bottled water. Take all of those bottles that would have went to the landfill. Let’s round it to 2 million. Let’s say that we can buy a bottle of water for 10 cents. Come on, get up off of the floor, I’m serious. Let’s just say 10 cents a bottle, times 2 million. Let’s see that’s…..$240,000!? If you could buy bottled water at a penny a bottle, it’d still cost $24,000. That’s a pretty serious savings right there and a great reason why a whole house water filter is better. The forth reason why is that it filters ALL the water that enters your home. Not only do you get to drink high quality water, you are also protecting your family from parasites. Across the country there have been outbreaks of Cryptosporidium and Giardia. In early 1993 Milwaukee was the site of one of the worst contaminations the US had seen, in many years. Over 400,000 people got sick form this outbreak. Some reports state that 100 people died from this outbreak of cryptosporidium. This was from a city water supply. 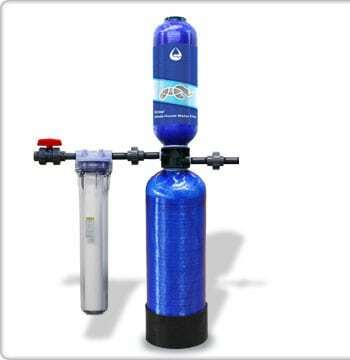 Want to know why a whole house water filter is better? Just ask anyone in Milwaukee that had one in 1993. The fifth reason why is that it protects your largest investment, your home. A whole house water filter removes sediments that plug pipes. This sediment will also fill your water heater making it less efficient. A house water filtration system will also cut back on the scale build up on your expensive faucets, tub and shower walls. Last, but not least, the sixth reason why is that it protects you and your loved ones from dangers, that can’t be seen. This is probably the most important reason for why a whole house water filter is better. If you remove the chlorine from your water, then your chloroform gas levels should drop. Chloroform gas vapors are suspected as causes of asthma, bronchitis as well as allergies. Maybe even cancer? But that’s only part of the story. Did you realize that many experts suggest that you actually absorb as much, or more, chlorine through your skin, than you do when you drink chlorinated water? then just turn on the TV news. It seems that every day someone is dying of cancer, or of some contamination. Protecting your loved ones is the bottom line. It’s what we all instinctively do. Clean, safe water is why a whole house water filter is better.